Extended Day is the culminating year of our three year Primary program. This class, typically comprised of children who have already had significant experience with Montessori classroom materials, meets in Liz and Sarah’s class every day for an afternoon of extended curriculum. The afternoon begins with a lesson, most often something from the Cultural area – Geography, History or Science. While it is the teacher’s role to initiate these presentations, Extended Day children are eager to share ideas and ask questions. Group-time regularly evolves into a lively, collaborative discussion. There is a wide range of topics covered over the course of the school year. These are subjects that children have had exposure to in their Primary classrooms, but now have the opportunity to explore with greater depth and level of detail. 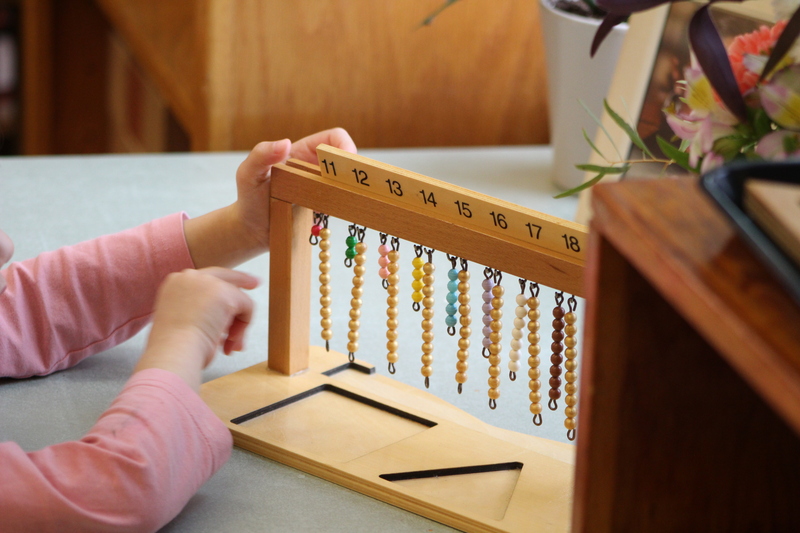 (Children will continue to revisit these subjects time and again as the Montessori Method is a spiral curriculum that children cycle through repeatedly, allowing for increasingly greater depth, sophistication, and levels of mastery. Through hands on experiences, Extended Day students learn about the solar system, planet earth, and travel with their classmates to every continent. They examine the differences between living and non-living things, plants and animals. They begin to think about how scientists form classifications and engage in their first research projects. Extended Day students have a thirst for non-fiction and love information. They eagerly experiment with electricity, magnets, and light. Extended Day children also work daily in the Math and Language areas, either revisiting work previously introduced or grappling with new, more advanced materials. They do so on individual trajectories, each making progress at his/her own pace. Students also apply their academic skills as they work throughout the environment, most often by making written records of work in the Cultural areas. Extended Day students also serve in leadership roles in the Primary level. As the third years in the classroom, these children have developed comfort and familiarity with the environment, materials and processes. They are proud role models for younger, less experienced children. When an older child works with a younger one, they are deepening their understanding of the materials and are increasingly able to reflect on all they have learned. These relationships fuel the older child’s confidence, willingness to take risks, and joy of learning. The Peace curriculum is an important element of the Extended Day year. Great effort is made to establish a profound sense of community within this group. As a result, a community develops over time that values each individual’s strengths , while understanding each individual’s challenges. These children thus form- at a young age- deep and meaningful bonds, potentially for life! Peace is eating ice cream. Peace is my chickens chirping. Peace is playing with my cat. Peace is riding on a pony. Peace means that things are quiet like a fishing boat on a peaceful sea with the people aboard sleeping. Peace means grassy hills with rain, ponies, and sunshine. Peace is my mom and me holding hands. Peace means playing baseball with my mommy and playing soccer with my daddy. Peace is a dragon. Japanese people think so. Peace is running in a field. Peace is a quiet beach at night and no one is there. It’s even better when it’s raining. Peace is being able to read the Magic Tree House because it’s a chapter book and it doesn’t have any violence. Peace is a peace tower and the rooms have everything purple and it’s very peaceful. Peace is a potato chip factory because whenever I see one I feel peaceful. Peace is an ocean with a blue sky and different colored fish jumping out of it. Peace is a field with flowers in it. Peace is love. My house is peace because I love it. Peace is when the fire fighters are sleeping.